Changes. How do we cope? I feel somewhat unsettled tonight. There have been significant changes at work recently and they culminated today with some news that, while not directly affecting me, will impact both my work and relationships with colleagues. Confidentiality prevents me from going into too much detail here, but suffice to say that things are unsettled and it would not be exaggerating to say that the fallout will affect both staff and clients over a large geographical area. When I walked into work this afternoon I discovered that there was a bowl of chocolates sitting on the table. I successfully resisted them. With the unsettling circumstances and emotions flying around the office, on the way home I found myself fighting internally with the urge to stop for some cold rock icecream. I won this battle as well, and less than 4 minutes later I pulled into McDonald’s and bought myself a McFlurry and a hot apple pie, eating them as soon as I walked in the door at home. I did so consciously, fully aware of my actions and the impact they would have. Do I feel better for having indulged? No. Do I feel worse? A little. I allowed my excuses to rule my actions, when I know I have done so well in recent weeks. That said, I know that this is one event, and one event does not mean failure. It means a lesson. I have learned that it is best not to make decisions that may adversely affect your progress toward goals whilst in the moments of emotional turmoil. And while easy to say, this is much more challenging to DO. So, the next time I recognise that I am feeling unsettled and in some turmoil, I will take a DIFFERENT route to my destination and practise some self care. I am beginning that today with an early bed time to do some reading, followed by a good night’s sleep. Definitely needed tonight. Only time will tell how things will pan out at work, particularly considering that I will be required to use my skills to support a lot of people in the upcoming weeks and months as they adjust to the changes being made. I will need to ensure that I look after myself as much as I can, and be open to learning my own lessons and furthering my professional skills. I have recently posted about new achievements with fitness, nutrition and mindset. For many many years I was in complete denial about my lifestyle and the effects it had on my wellbeing. I had no desire to do anything much other than sit around feeling sorry for myself, believing that I did not deserve anything other than what I had. Which was very little in terms of satisfaction with my life and who I was as a human being. I buried my emotions by eating everything in sight and rarely noticed or acknowledged what I was feeling. I essentially numbed myself so I didn’t have to acknowledge the state my life was in. Signing up for the 12WBT has been instrumental (amongst other significant events in my life) in helping me to regain and create the life I want. Round 1, 2012 was rocky and I allowed my mind to rule my behaviours. I regularly ate unhealthy foods (though they WERE a lot healthier than I used to eat) and did not train. My weight yo-yo’d throughout the 12 weeks and I think I gained and shed the same 5-6kg again and again for about 8 weeks of the round. Also during the round I was dealing with the after effects of two major things in my life. Firstly, in week 1 I completed the thesis required for my psychology honours program, which left me with a lot of empty space in my diary and my head. The other significant events revolved around my personal boundaries. I had people in my life who regularly stepped over those invisible lines, primarily because I was unaware of where they were myself, and therefore I did not enforce them. In realising where those lines were, I chose to pare down the number of people in my life, and more specifically, the number of people in my home. This left me with a lot of left over angst, including guilt, shame and uncertainty about where to go next. There was a hole left not only in my home, but in my head. So, much of round 1 was spent processing some of these emotions and dealing with them. I made plenty of mistakes, ate lots of “wrong” things and paid the price with a lot of fluid retention, bloating, a lack of exercise and frustration with myself. However, I learned a lot about my body and how it reacted to certain foods, particularly those with sodium. This has clarified for me, how my body reacts and processes certain foods. At the end of each round of 12WBT a major finale event occurs in a chosen capital city. For round 1 the event was in Melbourne. A large outdoor group workout in the morning, followed by a more formal celebratory event in the evening. The 30+ crew, being the huge supportive team they are, arranged for a large number of us to attend the event, staying in the same general area and getting together for various events and milestones over the relevant weekend. At the encouragement from the team, I decided that I would attend the event and took 2 weeks leave from work to take a decent break and visit family and friends. I decided to do a road trip and visited some of the 30+ crew in Dubbo, Orange, Canberra and Melbourne. I committed to climbing the 1000 steps in Ferntree Gully, had dinner with a large group the night before the event, and then participated in the official world record breaking outdoor workout and the formal evening event. With extremely sore muscles following the Friday and Saturday workouts, it wasn’t until I was 3 hours north of Melbourne on my way home on the Sunday morning, that I began to realise exactly how big these events had been for me. For someone who had always avoided any strenuous activity through fear of failure, even attempting something like climbing 1000 steps was a huge deal. Add to that the continuous movement for 1 hour 20 minutes during the official Saturday workout, and then attending the formal event in the evening, it took me a while to realise how huge this was for me. Meeting a lot of the crew in person during these events I think added to the overwhelm and suddenly, during the drive home, it hit me. Participating in this weekend was a big achievement and it showed me that I am capable of a lot more than I had previously considered. So, about 2 days after arriving home and having a chance to allow my brain to process everything that had happened, without realising it, something clicked in my head. I suddenly found myself feeling slightly ill at the thought of eating unhealthily. By the time I arrived home it was well into the preseason for round 2, so I did some work on those tasks, which helped me to clarify what I wanted in my life and those thoughts (excuses) that were holding me back from getting it. I’m not exactly sure what actually clicked in my head, but regardless, the results I have achieved since coming home (blogged in a previous post) has been unparalleled for me. I have no doubt that a large portion of my success since being home has been due to my experiences while in Melbourne. And of course this must include the meetings with members of the 30+ crew, their incredible support, the atmosphere of participating in the finale events, both official and unofficial, and meeting the people along the road trip that got me to the events. Every single one of these people, and more, have helped me to get into the headspace I currently enjoy. Thanks girls! It’s been a while since I have posted here regularly so I thought I would come and do a little catching up of how things are going fitness wise. Whenever I train my heart rate jumps pretty high very quickly. Within 1-2 minutes it is up into the zone where catching my breath is difficult! 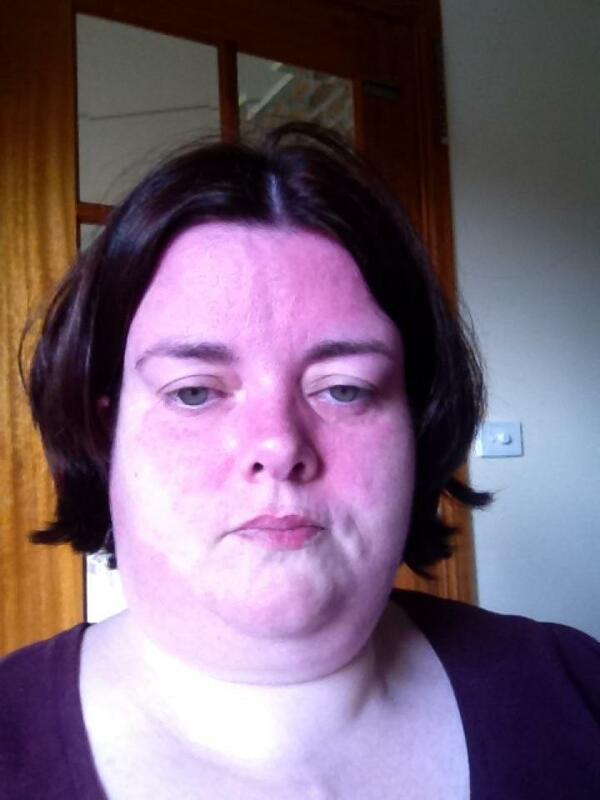 And every time I do a cardio workout, at the end my face is the colour of a beetroot. Kind of like this …. In round 1 of the 12WBT this year I allowed my head to get in the way big time, and while I did several aqua classes, overall I didn’t achieve much fitness wise. This round has seen a big difference in my mindset. I’m not sure whether this has resulted from my trip to Melbourne for the round 1 finale (I suspect it is), but whatever it is, I just know that things are different. When I set my goals for the preseason task I decided that I wanted to work on breaking through some barriers and doing things that would 1) push me outside my comfort zone, and 2) push me past the point where I think I can accomplish things and achieve more than I think I am capable of. In the 3 weeks of this round so far I have done this several times. Firstly, I committed to attend my first SSS with my local Toowoomba 12WBT crew. In round 1 I was invited along to their sessions on numerous occasions and assured that all ability levels would be catered for, and yet I declined the invitation. Fear much?? My second effort at this same SSS resulted in a 1206 calorie burn. My second choice and commitment to help me to overcome barriers has been the decision to invest in some personal training. 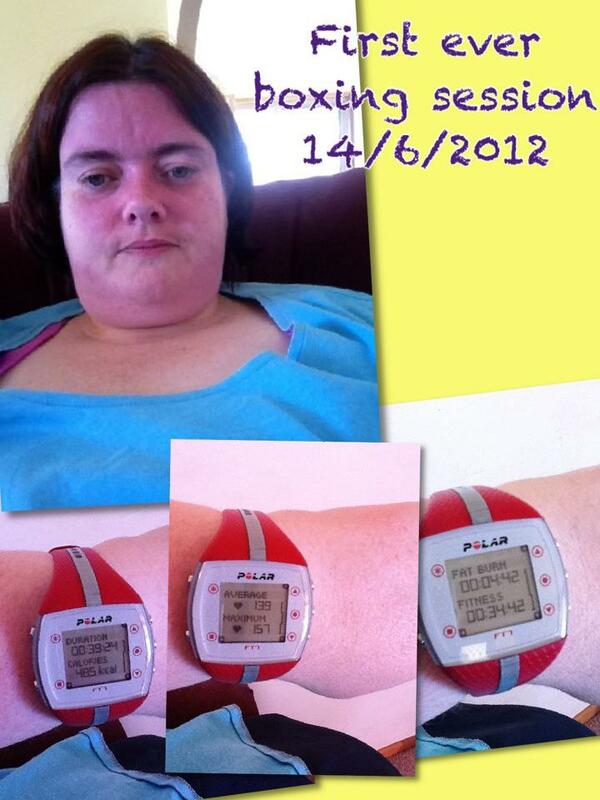 I spoke with one of the local Toowoomba girls (also a PT) and arranged to do some sessions with her. After 3 sessions I am feeling really positive about where things are heading. This is the result of last week’s PT session. Only once in the past few weeks have I had sore muscles after a workout, and today my PT told me that I am physically strong! That I have the muscles that are developed and I just need to kick in a few different systems. Can you believe it?? I’m physically strong! Who knew!! I feel like I want to keep pushing my own limits to really discover what I am capable of! I’m not sure what I want to talk about tonight, I just feel the urge to write. So here I am. Lymphoedema. For those who don’t know, this essentially means that the lymphatic system doesn’t work correctly. It manifests as swelling in affected limbs. The lymph fluid pools in the limbs because it is unable to get to the lymph nodes, from where it travels to appropriate parts of the body to be ejected as waste. Most people who get it have experienced some kind of trauma to the body. Women with breast cancer who have had the lymph nodes removed, for example, often get it in their arms. People who have been in some kind of accident can get it, depending on which part of the body has been traumatised. And sometimes, as in my case, there is no known cause. I’ve had it now for 17 years. Since 1995. Treatment for it includes wearing compression garments on affected limbs (in my case for 24 hours a day, except whilst in water), lymphatic drainage massage and a stringent skin care routine to prevent infection. In recent years, for the most part it is kept under control, though sometimes it can be a little draining to maintain the routines on a regular basis. Occasionally stuff happens to mix things up and upset the status quo. Several years ago I became ill with the flu and the infection left me with a pocket of fluid in my belly (apron), which at the time was very inflamed and infected. The infection cleared itself up, but the fibrous pocket of fluid remains. Occasionally I’ll have some trouble with this (has only happened twice before), as I do now. Since yesterday I have had some pain (not huge amounts, but definitely noticable) around my navel, the pocket has been more swollen than usual, and there has been some seeping of lymph fluid from my navel. With a small amount of blood. The times this has happened before have been when I have received new compression garments (have to replace garments every 6 months or so as they wear out) and they have been tight enough to push extra fluid out and it ends up coming out in odd places. It has only lasted for about 2 days and then goes away on its own. I’m told by my physio that it’s normal given the circumstances. This time is a bit different. No new garments, so in theory there shouldn’t be any extra fluid to get rid of. That said, the fluid is still seeping. So in looking at what could possibly be the culprit for it, I was looking at the recent changes I have made with my lifestyle. Primarily the new exercise habits. One of the nurses on the forums assures me that when you increase your exercise it can be common to retain extra fluid due to increased blood flow. I am trusting that this is true and just taking things easy for a couple of days in the hope it clears up soon, and just focusing on the skin care routine and taking care of myself. I’m told that it shouldn’t seriously interfere with my new training routine, but I am backing off slightly for a couple of days. Especially since my new PT will be thrashing me on Thursday with another boxing session! Added to that, I have had a Bowen treatment today and have been told to not train for 24 hours. So I’ll do a shorter session when I get home from work tomorrow (Wednesday) and then straight into the PT on Thursday. In Round 1 I had a lot of difficulties with training consistently. I allowed my head to get in the way of my success, and excuses had me either sleeping in too late to train before work, or sitting in front of the TV. Don’t get me wrong, I did train, I just didn’t do it consistently. At the most, I did 2 training sessions per week. 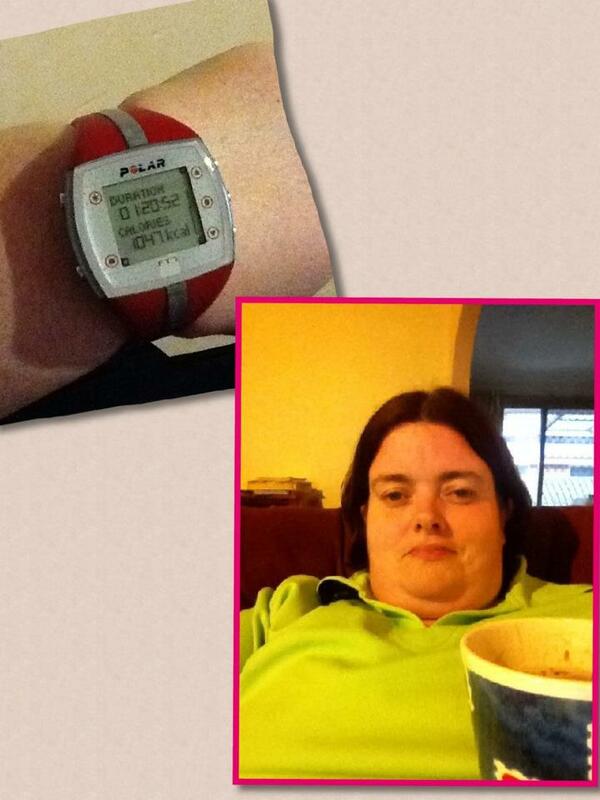 Today I did two shorter sessions totalling 641 calories. And I knocked time off my time trial during both sessions. Just under 30 seconds the first time, and 40 seconds the second time! Overall I am really happy with this progress. I have been using the JFDI philosophy and surprise surprise, it’s actually working (who knew? LOL). My major fitness goal this round is to make training a part of my everyday life. To help me to do that I decided that I was going to invest in myself and work with a personal trainer. I’ve done the PT thing before several years ago at the gym I belong to, and I worked with several people. All but one of these essentially just watched me doing my normal program and threw in a few “atta girls” occasionally. Looking back, they didn’t do much for me. I have now had 2 sessions with someone new. Someone who is a part of the 12WBT and knows the philosophies the program encapsulates. It’s still early stages and so far I am very happy with how things are going. This trainer is a part of our local 12WBT crew and attends the weekly SSS, and also keeps me on track via our Facebook page. She is encouraging and supportive, and during sessions doesn’t let me slack off. Already she has supported me in achieving 2 of my one month fitness goals. I have now done boxing for the first time ever! I am feeling very satisfied with where I am heading with my training and cannot wait to see where this journey continues to take me. And to top it off, I am starting to think about other challenges I’d like to try! Never thought I would be doing that!!! I haven’t been around for a few months to update this blog due to computer issues, which have been incredibly frustrating. That said, the issues have been sorted and I am back! We are into the second week of round 2 of the 12WBT and things are going really well! Since January I have donated 20kg to the universe and at the end of round 1 I went to Melbourne to attend the finale event. A hug from Margie (The biggest Loser), a “how are you going?” and some other encouragement from Michelle Bridges, a 914 calorie burn from the world record workout, many meetings with other awesome 12WBTers, lots of fun, a very long road trip and some not so great food choices along the road, I feel like there has been a pretty big change in my mindset. A few days after I got home in late May, something seems to have shifted in my head. I have consistently been making healthy choices, with both nutrition and training. I have been cooking and exercising regularly, with decent calorie burns. I have decided to get myself a Personal Trainer and we have had 2 sessions so far. I’ve done 4 training sessions in the past 6 days, which has been a record for me since I began this journey in January. After coming home with an extra 6+ kg, in the time since then (May 23), I have donated a massive 11+kg. About half of that was the “extra” I brought home from Melbourne, and the rest has been a continuation of my journey. Round 2 of the program began June 4th and I have donated 2.5kg since then, with the next weigh in scheduled for 4 days away. So, something has shifted in my head. I am somehow more determined than ever to get to where I want to be. I have not had any real desire to eat potato chips or chocolate, and I have learned a lot about how my body responds to even small amounts of sodium. I have taken steps to counteract those effects and am avoiding the foods that contribute, even in small quantities. While this has not always been easy, the results are definitely worth it! I am retaining much less fluid, and with a higher water intake, I believe this has contributed to the recent significant weight donations. From the preseason task requiring us to write our goals, I have already met at least 3 of them, including working with a PT, attending an outdoor training session with some of our local 12wbters (second session today), and creating a vision board. For this round I have set myself the goal of donating 20kg to the universe, 2.5 of which has already been made. I am feeling really positive about it and have seen some physical changes in my body even in the last 3-4 weeks. It has also hit me how simple the process of this program really is. One day at a time, one healthy choice at a time. Not necessarily easy to make, but definitely a simple process.